In our lab, the Sennheiser HDA 200 headphones are widely used for anything audiology related. They are pleasant to wear for a long time, have a flat frequency response and high passive ambient noise attenuation as they are based on PELTOR hearing protectors. Sadly, these headphones went out of production. And according to Sennheiser, there is no way that they will resume production. Instead, they recommended their designated successor headphones, the Sennheiser HDA 300. For both headphones, technical data sheets with information on passive attenuation and sensitivity level (frequency response) are available from the Sennheiser website (HDA 200, HDA 300). 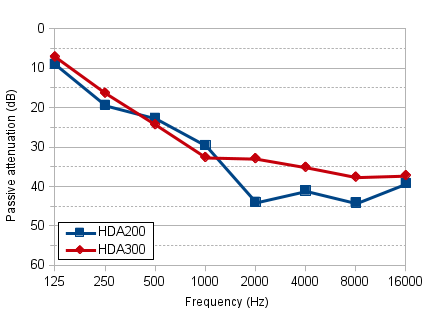 For passive attenuation above 250 Hz, the HDA 300 is worse than the HDA 200, with an average difference of 16 dB for the frequencies range from 500 Hz to 8 kHz. 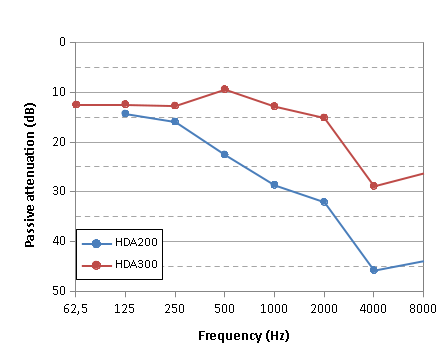 For the flatness of the sensitivity level, the profile of the HDA 300 has a standard deviation of 9 dB (octave frequencies 125 Hz to 16 kHz), which is nearly twice as much as the 5 dB for the HDA 200. The HDA 300 headphones weight 490 g, an increase of 50 % over the 330 g of the HDA 200. The transducer impedance of 40 Ohm is reduced to 23 Ohm. We tried to reproduce the data on passive attenuation and sensitivity level for the two types of headphones. The measurements were done in a sound-proof room with a Brüel & Kjær artificial ear 4153, with 4 speakers creating a diffuse noise sound field of about 70 dB(SPL). For the frequency sensitivity measurements, a continuous sweep was used. One side of the headphones was placed on the artificial ear, while the other side was wrapped around a side of the measurement table. With this setup, we could observe a smaller difference in passive attenuation of 8 dB (octave frequencies 2 to 8 kHz) for frequencies above 2 kHz instead of 500 Hz. For lower frequencies, no difference was found. We suspect that the difference between our measurements and the official Sennheiser data is caused by our less-than-perfect measurement setup, especially the way we fixed the headphone to the artificial ear. For the sensitivity level, we measured a standard deviation of 3 dB for the HDA 200 and 9 dB for the HDA 300 (octave frequencies 125 Hz to 16 kHz). 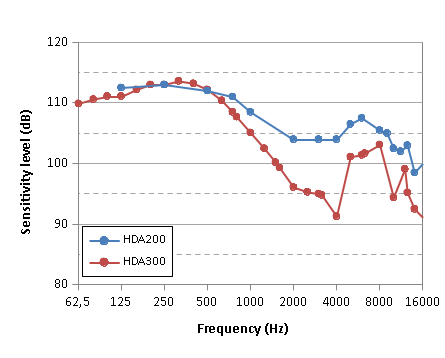 Compared to the HDA 200, the HDA 300 headphones have less passive attenuation, a worse frequency sensitivity profile and are much heavier. We are not impressed. As far as I know the two headphones should be measured with a different artificial ear. The HDA 200 (circumaural) with the 4153 and the HDA 300 (supraaural) with the 4152.
thanks for the suggestion! We discussed about the artificial ear to use, but decided in favor of the 4153 for the HDA 300 to get a more comparable setup. 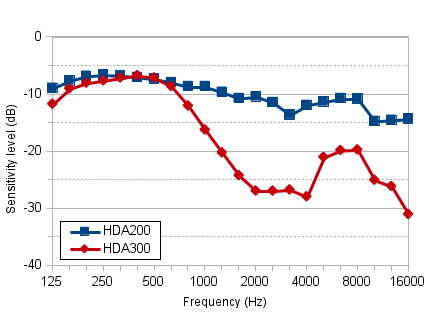 In the technical datasheet on the Sennheiser website (http://en-de.sennheiser.com/audiometers-headphones-high-frequency-testing-closed-dynamic-ear-protector-hda-300), the HDA 300 is actually specified as circumaural, although it seems to be a bit more supraaural than the HDA 200. SO WHAT YOUR SAYING IS THAT THE 200 IS BETTER THAN THE 300? For our application we would have liked the HDA200 better. You mentioned that you tested with headphones looped under the end of the table. I want to test the HDA 300, too, but I'm concerned about knocking the ear onto the floor. How did you do that? How did it work out?